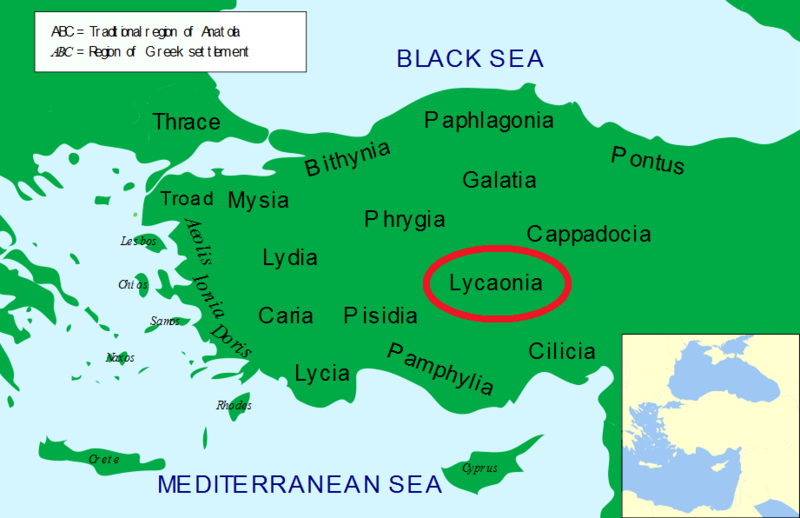 Lycaonia was a large region in the interior of Anatolia, north of Mount Taurus, bounded on the east by Cappadocia, on the north by Galatia, on the west by Phrygia and Pisidia, and on the south by Cilicia. The Lycaonians were like their neighbors the Isaurians a wild and lawless race of freebooters; but their country was traversed by one of the great natural lines of high road through Asia Minor, from Sardis and Ephesus to the Cilician gates, and a few considerable towns grew up along or near this line. The ancient coinage of Lycaonia is quite limited. Coins appear to have been struck sporadically and perhaps mostly for prestige or important occasions.